Juicing & its health benefits have really got a lot of attention in these past few years. If you are reading our article, you are probably thinking of buying a good juicer for you or your family. Juicers tend to vary in type, quality & as a result price too. Juice cleansing or detoxing is becoming a very popular option for folks who love to stay healthy and shrug off any sluggish or bloated feeling rather quickly. Juicing has a ton of benefits like improving energy levels, wellness & much more. It’s easy to increase your alkaline intake through juicing too. Many juicing recipes are being prescribed or created day after day. With plenty of celebrities jumping on the band wagon, juicers are becoming even more popular. We combed through a fair number of juicers in the market to come up with the best juicers & the best slow juicers to be found. “What’s the difference?” is probably the first question in your mind right about now. A normal or centrifugal juicer is what you would have probably been used to all these years. This machine, as the name suggests, utilizes centrifugal force. A blade basically spins at a very high RPM slicing through the fruit. The RPM on a centrifugal juicer is extremely high and it can slice through just about anything. Another upside is that these are quite inexpensive. A slow, cold pressed or masticating juicer as they are called uses a much lower RPM and as a result consumes much less power too. Most of them are great at juicing nuts (very important for some folks), cut pieces of fruit & veggies and some do handle large chunks too. The fruits are cut & pressed which is similar to masticating, so that the freshness & the enzymes stay intact. You do get a lot more pulp in these for those who like that. The difference between the two lies in the critique associated with juicing from back in the day. People always say drinking juice is never the same as eating an entire vegetable. Well, with centrifugal juicers they do have a point but not so much when it comes to cold pressed options. With centrifugal options a large amount of heat coupled with the fact that a lot of the smaller particles are always pushed to the sides, ensure that the nutrient loss is quite high. The heat produced will oxidize the enzymes rendering the output far less nutritious than desired. Although more expensive, cold pressed juicers retain a lot of the nutrients from the fruit or veggie as there is far less heat produced. Not everything is rosy with the slow juicers. Centrifugal ones have their positives as well, as the juicing process requires little to no prep time. We’ve tested and reviewed a bunch of different juicers and picked the best ones for 2017. First we take a look at Breville’s Je98XL Juice fountain, number 1 on our list. This is a powerful centrifugal system that can get through just about anything you can throw at it. The Breville has a wide 3 inch chute which means you don’t have to prep too much like you do with other centrifugal options. The overload protection indicator & systems are very handy. It’s easy to assume that a machine with such high RPM can slice & juice a lot. It’s probably this assumption that makes most people overload their juicer. The Breville will keep you well protected in this scenario. Whilst the Breville performs well it’s not very good with leafy greens. There are only two speed options designed for hard & soft fruits but for the user who wants great juices and a simple way to make this this is a great item. The overall design and appearance of the juicer is very pleasing and it will suit any kitchen counter. Certainly worth the money. Now we come to the Hamilton Beach, a brand synonymous with excellent kitchen appliances. The chute design is very similar to the Breville we touched on earlier. This device might not be the most aesthetically pleasing out there but it is certainly one of the handy ones. The 67601A juice extractor is pretty easy to clean too. The Hamilton beach is very easy to clean as well. The filter can be cleaned with a handy brush that comes along with the juicer itself. Moving onto the more contentious issues. First up, the pulp. This device does produce a pulpier juice from time to time as reported by some users as well. This can be quite subjective as to whether it is a positive or a negative. The build quality is not as high as the stainless steel variants on the list. This device has a fair few more plastic elements. This is a pretty normal trade-off if you are looking to juice occasionally and are after an inexpensive alternative. 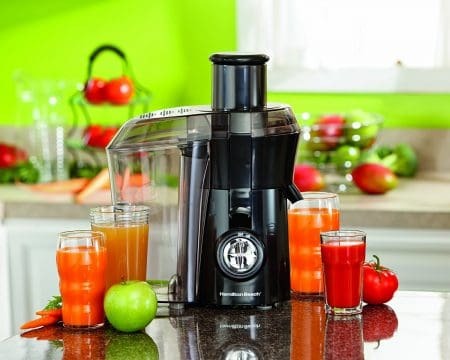 This juicer is a great choice for those looking for a good brand and a very cheap price. The big mouth juice extractor gets the job done in a simple yet efficient fashion. Perfect for those who like to make a moderate but not large amount of juice regularly. The Omega J8006 Nutrition is not one of your tower like conventional juicers but it certainly is one of the best. First up, the 8006 has a decently wide chute which ensures you can load fruits & veggies in quite easily. For leafy drinks where celery, mint, spinach and other things are involved the J8006’s performance is outstanding. The machine can be very easily taken apart and cleaned as well. The food processing attachment was terrific too allowing you to make things like salsa, chop and mince items like garlic and ginger too. Masticating juicers are known for being great with nuts. If you are one of the growing number of people drinking almond milk then you might be looking for a slow juicer that helps you out here. The nuts with the nutrition centre tended to be on the flaky side rather than having a desirable thick creamy texture. This was only a slight draw back. The output is positioned in such a way that it is quite comfortable to obtain a rich glass or two but you might not be able to obtain a very large amount like some of the other option on our list. The J8006 is indeed feature packed but is also one of the more economical options in the market. The value for money is great when you consider the versatility & raw performance on hand. Despite there being a fair few pieces to clean a lot of those are indeed machine cleanable which makes it easy. This mid-range model is not great for greens however but sometimes repeated application can do the job. Some users have reported that the machine can be overloaded fairly easily cause errors to occur. The display is neat with pre-sets for different types. The juice is collected and the spout is sufficiently high as well allowing you to make juice of different quantities. Pricing-wise its very similar to that of many mid-range juicers including the other Breville on the list. This is why thanks to its versatile features & extraction quality, we think this juicer offers a lot of value to any person. We move onto the Black & Decker extractor an ideally suited option for the casual juice drinkers. The device has a simple build and a relatively large pulp collector. The amount of juice it extracts is quite good although not as much as the BJE510XL and higher end options. The pulp collector is quite large & transparent meaning you can readily get a sense of the extraction quality. A 300ml juice pitcher is provided which comes in handy too. A criticism with this device is basically the size of the feeder tube which is quite small and can increase the prep time before juicing. This juicer has few dishwasher washable parts & can be cleaned easily externally too. The drawback lies with the fact that the filter is quite fine and it can be hard to clean that. Other models like the Hamilton beach all come with a brush to ensure you can always clean the filter. Some users also reported durability and heating issues as well. The heating issues do arise when overloaded & Black and Decker do have great customer service. Being the most economical on the list we can say that the Black & Decker’s value appeals to the more casual juice drinker. If you are thinking of going on a juicing spree by replacing a lot of your solid meals then a higher end option might suit you better. For the occasional drinker looking for a healthier alternative to a plastic bottle drink then this will suit you just fine. The Cuinsinart is a great alternative for those looking for a quiet juicer with good build quality. Coming in at 1000 watts, the Cuinsinart has the most powerful motor amongst the ones on our list. This device has a dial which you can rotate to set different speeds for different items. All the removable parts are dish washable as well except for the ones containing plastic. These can shrink or change their shape when exposed to very high temperatures. The feeder tube is also quite wide allowing you to comfortably place everything from kale, grapefruit, peaches to apples, strawberries and much more. The main criticism of the Die-Cast Juice Extractor is that it’s not very efficient at its core functionality when you try & juice certain items. Pulp yielding ingredients can have a lot of waste as some users have mentioned also. Be sure to clean the filter repeatedly especially when dealing with strawberries as they can clog the filter on just about any juicer. The pitcher is also very well design and the output barely has any froth which is a very good sign. If you are seeking a not so expensive juicer with great build quality & aesthetics then you have met your match. The price is much higher than the Hamilton Beach but lower than the Breville & most of the slow juicers you will read about in the next segment. Next up, is the Hurom Elite slow juicer. Hurom is one of the most popular brands when it comes to juicers and it’s no surprise why. The Elite slow juicer is one of the most versatile on the market as it handles nuts even better than the aforementioned Omega. The device is easy to clean which is very important as slow juicers tend to be on the bulkier side when compared to their centrifugal counterparts. The performance is simply excellent with very little waste and great tasting juice. The downsides are more related to some durability issues with the motor that users have reported too. Customer service is not one of Hurom’s strong points. Their build quality is however top notch to begin with how the device is designed. The feeding tube is narrow just as is the case with most slow juicers but it’s comfortable nonetheless. The positioning of the output ensures you can collect a good amount of juice in one go, although a carafe might not necessarily fit under the nozzle. Hurom is a premium brand when it comes to juicers and this is reflected on the price of the device. The power consumption is quite low too adding to its overall value. It’s versatile, definitely as versatile if not more than the Omega we touched on earlier. Great at making milk, marinades, sauces, juice (of course) & much more! The Tribest Slowstar is one of our favourites on the list and let’s delve into why. It' (pardon the expression) a star among slow juicing machines. The slow 47 RPM motor coupled with the double edge auger can handle most things you can throw at it with relative ease. A strainer is present to remove pulp if you like the juice to be pure. The compact size coupled with the great build quality in our opinion, is a huge plus. Vertical cold pressed juicers usually tend not to handle leafy greens well and this is where the Slowstar’s weakness lies. Just like most cold-pressed juicers out there it’s not exactly easy to clean with no dish washable parts. Tribest does provide tools to make the job much easier than other options in the market. This is the natural trade-off for those who don’t mind spending the extra buck to ensure that the vitamins & enzymes are all intact. Thee Tribest juicer is indeed marginally expensive but it is well worth it if you are looking to have a tasty and nutritious glass of juice once or twice a day. In our opinion, it is the go to choice if you like a pulpy juice. The SKG is another great option on our list. The wide chute grabs our attention right away and is a huge plus in comparison to what other big brands' juicers have in the masticating juicer segment. This will greatly reduce the prep time as you do not have to cut the fruits and veggies into fine pieces. There are plenty of protection mechanisms in place too for unstable power, overloading and even a reverse function to unclog which is very handy. The SKG is doesn’t have too many downsides. It is quite tall which can make it unsuitable for certain kitchen cabinets & counter tops. Some users have reported issues of leaks next to the pulp exit. The 60 RPM motor is quicker than the ones on the Hurom & Tribest which you will see but it is still slow enough to reduce the heat produced and prevent oxidation. The piano varnish finish is a classy touch too. The SKG is a great high end juicer which is priced below the Kuvings and above the Omega. The features and performance add great value for the consumer who decides to buy the SKG. The design is well thought out and the ease of use can really save you time. A superb choice for the serious juice lover. Finally, we review the Kuvings 6000S, another popular brand amongst juicers worldwide. This tall, but highly functional juicer is great at just about everything. It performs well with leafy veggies too which is usually very rare for a vertical masticating juicer. There are plenty of safety systems in place to ensure overloading or overheating doesn’t take place. Once overheated the machine can’t be used for at least 30 mins. The operation is pretty quiet and a slight drawback is that this device has a lot of moving plastic parts which can hamper its durability. The base however is very well made and aesthetically will suit any kitchen. Despite the feed tube being on the large side we and other users noted that for optimal juicing the pieces needed to be a bit smaller. The upside is that they don’t have to be as small as those needed for the Omega but have to be reasonably small. This translates into a reduction in prep time that is normally associated with cold pressed or masticating juicing machines. The sorbet maker that comes with the machine is very convenient. The device is quite easy to clean too but the pulp discharge always takes a bit more time to clean. A superior high end juicer and a trusted brand which makes this rather expensive option a worthwhile investment. Suits folks who are looking for some serious nutrition and are not bothered about the price tag. The juicers on our list have been carefully selected through a selection process based on the most important criteria so that you have a pretty accurate review for each item on our list. We’ve based our reviews on these following 4 evaluation criteria so that we can guide you through the best juicers & slow juicers in the market. The materials involved in crafting the juicer is very important. Not only performance-wise but safety is also dictated by the build quality. It’s quite well known that juicers need to reduce or mitigate the oxidation process and the design must also facilitate this. Our list consists of juicers that have grade polymer or stainless steel moving parts. This is a boon as plastic tends to be on the flimsier side which can affect durability and in turn affect how we view the product as a whole. A large chute is also something that we considered to be very important, if not essential. Juicers which allow the user to see the level of pulp & juice collected is highly desirable too. Sorbet makers and other accessories are great to have too. As far as design traits goes, chord lengths & height are two important aspects. You wouldn’t want your juicer to stand up too tall and not fit under or in a cupboard in your kitchen. The chord length is important but is quite subjective to where your power sockets are placed. The same needs to be said of horizontal options like the Omega juicer. As there are quite a few moving parts, we have also taken into consideration the availability of spares and the customer service involved in the process. We feel this is essential to obtaining the best possible juicing experience. The quintessential detail with respect to any juicer centrifugal or cold pressed is the yield. The ability of the machine to handle items like nuts, celery, kale, leafy greens, fruits & sometimes even coffee beans are very highly valued. Versatility can be an awesome trait to have especially in mid ranged options. This can help you save tons of space on the counter top as you don’t have to buy a separate device for different functions. The core of the machine however is its ability to juice the most frequently used items as part of the juicing diet. We’ve only opted for the machines that truly excel at this trait. Centrifugal options produce more heat and we’ve chosen models that reduce the amount of heat transferred as much as possible. We’ve only chosen centrifugal juicers that have the ability to retain enzymes and minerals. Despite this being a slow juicer’s forte we’ve gone with options that at least try to emulate this trait. It is scientifically proven the slow juicers excel at retaining and extracting the most out of leafy veggies too. A dry pulp following the use of a juicer is what we were seeking. The ability of masticating juicers to handle nuts and produce nut milk or the texture of the nut butters produced were factored in. The amount of ounces produced to the amount of fruits placed was tested and important for our evaluation. As far as power requirements go, centrifugal juicers tend to vary between the 600 to 1000 watt mark, which makes them power hungry. We’ve tried to weigh up the performance on hand to the power consumed. Similarly, the masticating juicers are around the 200-400 watt mark. Any level of automation with respect to the cleaning process or unclogging is sought after. Having removable parts which can be washed in the dishwasher can greatly speed up the juicing process. A machine that takes you 30 mins to juice and 30 mins to tidy up afterwards might defeat the purpose of juicing entirely. The chute size is an important aspect here again. Wider chutes are much preferred as they can reduce prep time on both machine types. Similarly the juice collection chute height can determine if you can juice straight away into a carafe of just a glass. Options like the Omega or Breville have the option of juicing solely into glasses. The higher the juice collection tube the more options you have with respect to the variable amounts you can produce in 1 shot. This is a simple yet easily overlooked feature. The pulp collection also plays a major role in how good a juicer is. This ties into our next important evaluation criteria well which is maintenance. We’ve also taken into consideration the inherent difference between the juicer types & compared centrifugal with centrifugal alone. Everyday care is mandatory when you are juicing regularly. It is imperative that your machine allows you to quickly clean every bit of fruit off from the filters and chutes so that one may safely use it again. Slow auger based juicers do not usually possess many or any removable parts making it a bit more difficult to clean. Nonetheless, devices that have a reverse setting and are designed in a way where the metallic filter and pulp collectors are easily accessible can be cleaned easily. Brands and models that provide brushes and other cleaning accessories can be very useful especially for those into the habit of juicing leafy substances. Instructions need to be clearly mentioned with respect to maintenance too. With respect to centrifugal options we opted for truly machine washable devices. At times plastic parts or flaps can be present which and be ruined if placed into the dishwasher. We’ve considered the ability of the manufacturer to provide spares & even warranty periods as well. These are important as the longer the life of the machine the more value it can provide. Q. Are masticating juicers slower at producing the juice than centrifugal ones? No. They both produce juice at roughly the same speed. The main difference is the added time for you to cut your fruits & vegetables into smaller sizes. The other difference process wise is that slow juicers are much quieter and efficient. The pulp yield is a lot higher in masticating or cold pressed juicers as well. Q. I’ve owned many different slow juicer machines & they always tend to clog. What gives? Whilst, this could boil down to build quality in some rare cases, in most situations folks don’t tend to follow up dry fruits with wet ones. Since the RPM is quite slow the extraction efficiency can decrease if the substance like some nuts for instance are the only ones you are putting in. Some juicers have a reverse or anti clogging mechanism that will come to your aid. Otherwise wait out and use the brush and start over by alternating between wet and dry inputs. Q. What are some good accessories to have along with my juicer? A transparent carafe, glass or jug for collecting the sumptuous juice output. A froth separator, sorbet maker, food processor attachments, pasta maker attachments & cleaning brushes. Q. Does juicing have any added advantages over eating fruits normally? Incorporating fruits into ones diet no matter which way is very healthy. Especially for those looking to lose weight. Juicing is just simply one way of making sure you get your fair share of vitamins, minerals & enzymes required to stay fit & active. Q. How will juicing help me to reduce weight exactly? Losing weight simply translates into consuming less calories than you burn. Since folks on juicing only diets lack solid food their calorie count is roughly in the 500 to 1000 range. This will ensure you lose weight in the short term whilst still getting in your fair share of vitamins. The key is that all these are short term solutions. There aren’t too many scientific studies out there that outline the benefits of detoxing thoroughly. Q. Are there any negative effects of juicing? Not in the short term. However, long term you might not feel very full as this diet also known as a detox diet for some does not contain much fiber or protein which are also essential for the body. The fiber content is solely in the pulp you collect. It can be detrimental as this diet can lack the necessary B12 vitamins, calcium etc., also. Q. Sometimes there’s plenty of pulp leftover, what can I do with this? There are plenty of recipes out there where you can utilize the pulp, especially that of carrot & apple. You can even mix the pulp back into the juice to obtain a delicious smoothie. Otherwise, use it as an ingredient in homemade fritters, cookies, broth, marmalade and other types of foods similar to these ones. Adding the pulp back in raises the fiber content in the juice too. Q. How can I preserve my juice for later? Basically, you need to delay the juice’s oxidation process. Green matter & fruits tend to react with the atmospheric oxygen which can change their colour and increase the speed with which they become rotten. Add known anti oxidizing ingredients to your juice like lemon to ensure it lasts much longer so that you can enjoy all the work you’ve put in on one day for at least a couple more.